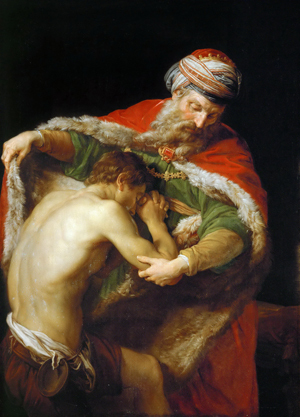 On the surface, the parable of the prodigal son seems to be just a matter between a father and his two sons, but it is a lot more than that. It is also a story about a community. When the younger son asked for his inheritance, the whole village would have known about it. It was a public insult to the father and the community, and everyone would have been upset. If the younger son had been seen returning, the entire community would have gathered at the edge of the village, stopped him, and let him know that he would never be welcomed back. It is for this reason that the father ran. It was quite immodest in the first century for an elder to run, and it would never be done. But the father had to run to the edge of the village so he could get to his younger son before the community did. He wanted to stop the rejection that would come from the community and publicly show his son forgiveness and welcome. As a community of faith, we are called to be just as welcoming as the Father to those who seek forgiveness and reconciliation.